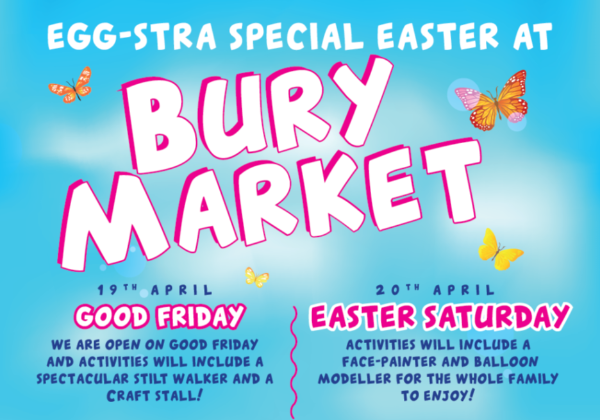 It's an Egg-stra Special Easter at Bury Market! We are open on Good Friday on the 19th April and activities will include a spectacular stilt walker and a Craft stall! On Easter Saturday on the 20th April activities will include a face-painter and balloon modeller for the whole family to enjoy! On both days the activities will be on between 11am - 3pm. Also we have an Easter Competition running over this month! The top prize is a Family Easter Hamper worth £50 and runners up will win one of 3 Easter eggs! It's simple! Just find our Easter picture board at the market, snap your pic and upload your photo to our social media pages (Facebook, Twitter or Instagram) and tag us in your post. Hurry! Closing date is Good Friday at 12 noon and the winner will be announced on social media. Presentation of the winners will take place on Saturday 20th April 2019 at 11am. Our social media pages are: Facebook - Bury Market, Twitter - @burymarket, Instagram - @burymarket.